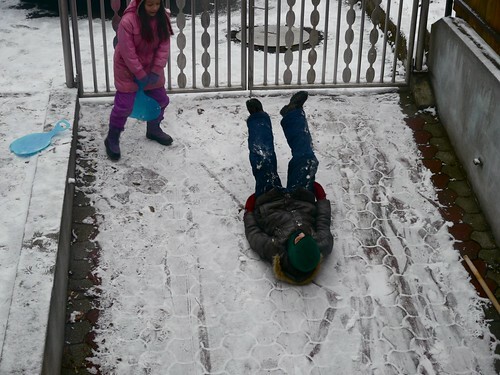 Above: The kids enjoying sledding on the steep incline of our driveway. There was just enough snow to last for morning fun. Above: Later in the afternoon our team traveled to our last show in the town of Vanyarc. 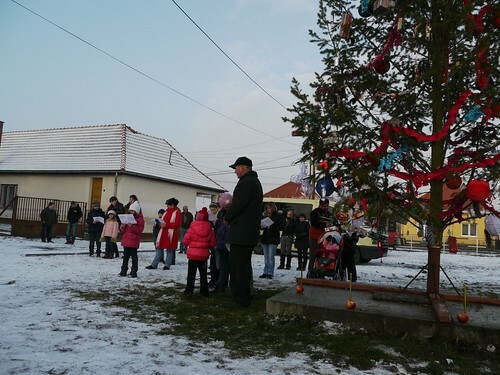 In many of these smaller towns and villages, they gather together to decorate the town’s large Christmas tree. 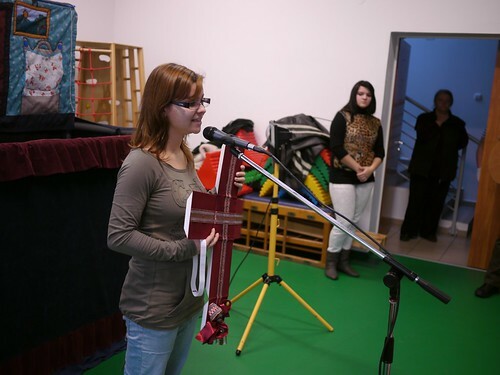 Our show was the special presentation in the community center after this event. 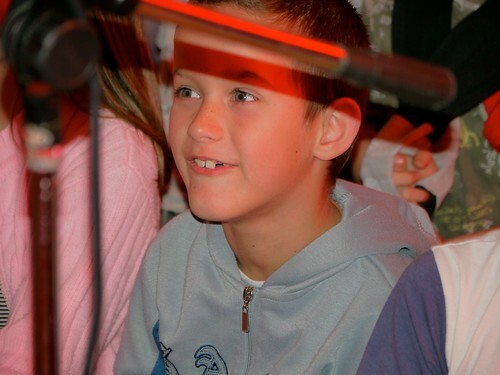 Above: Miki and Erika’s kids Bence and Anna helped with teaching the kids the motions to the songs. Above: This year’s team, Roger, Miki, Eniko and Eszti. It was great to serve with each member, each having a servants heart and committed to unity in Christ. Both Eniko and Eszti said they would enjoy serving again at Easter if God provides the opportunity. We’re very thankful for their commitment to this seed sowing ministry and praise God for raising up new workers to continue proclaiming the Gospel. Pictures are great, but maybe a little video will do a better job of displaying some of the joys of this ministry. Thank all of you who prayed for us through this intense time of ministry. 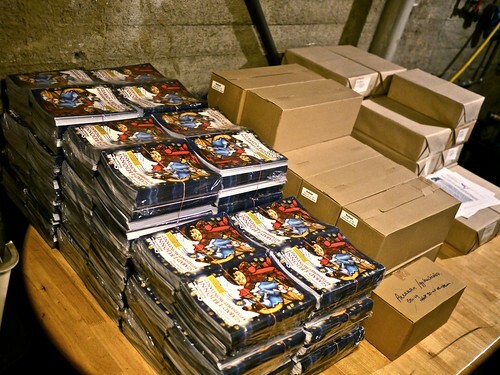 Thank those of you also who donated toward the gift magazines and CDs we were able to distribute to over 1,200 kids! Above: We decided to hold our worship service Friday night because of Christmas falling on Sunday. We continue to run out of room in our meeting place and tonight we packed in the most people to date. It is exciting to see the growth of the church and to constantly be introducing myself to people whom others invited to church. Above: Jennifer (left) wishing Peti’s little boy Darius happy birthday. This was Jennifer’s first time visiting our church. Above: Dezso, who preached the gospel praying with Bruno who decided to put his faith in Jesus after the service. 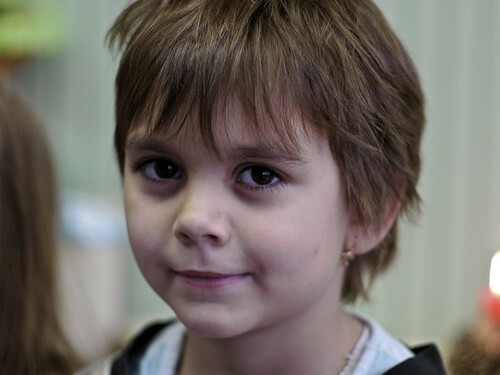 Bruno is the son of church member Tamás (Dezso’s neighbor). 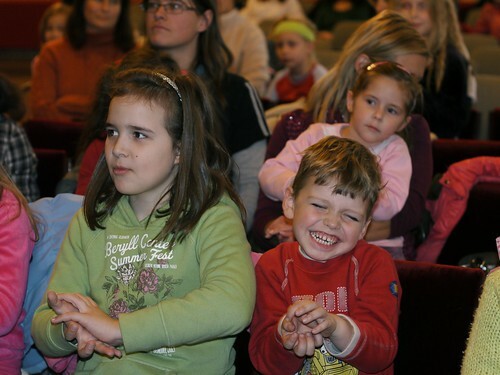 Above: Noami (back in green) is from the town of Rozsaszentmarton and has been attending Dezso’s house group. That’s Dezso’s daughter Adrienne giving me the crossed armed look with a smirk. 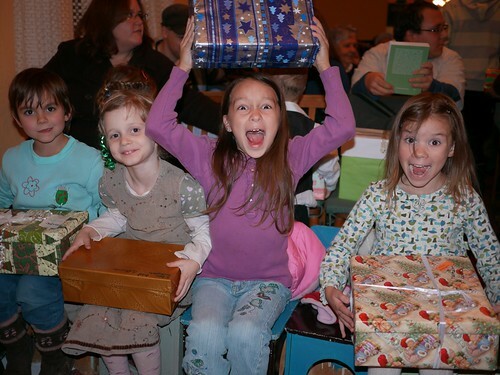 Above: Ellie wins for most believable fake expression of surprise as the kids receive gifts at church. Above: Our little Ziva continuing to bring joy to our family. 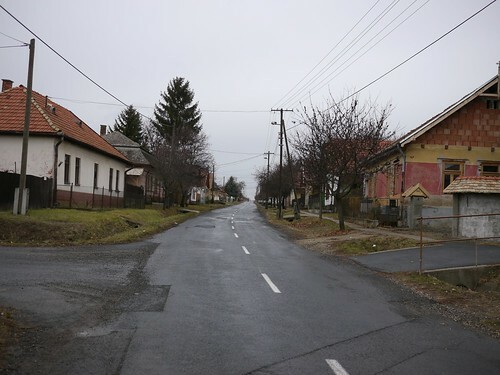 Above: After the Petofibanya contingent meets for prayer, we leave to pick up Eszti (above) at her house in the neighboring town of Lorinci. 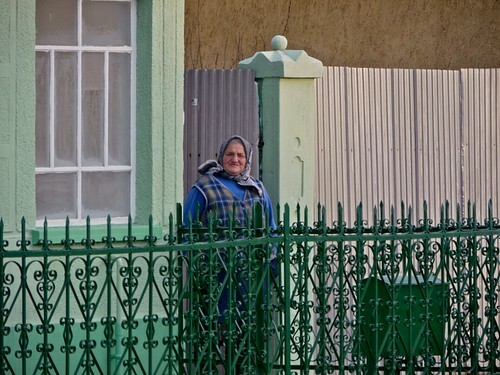 In the new year, we hope to plant a church just beyond those blue doors behind her. Her husband Peti has been busy over the past year, breaking down walls and renovating the entrance room as he looks forward to using it as a meeting place for the church. Above: An elderly woman looks on from across the street as we unpack our gear and enter Héhalom’s middle school. 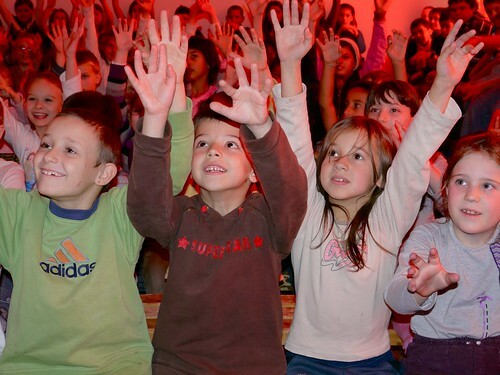 Above: We’re very pleased with the way this year’s presentation creatively draws the kids into the story of the birth of Jesus Christ, the Messiah. 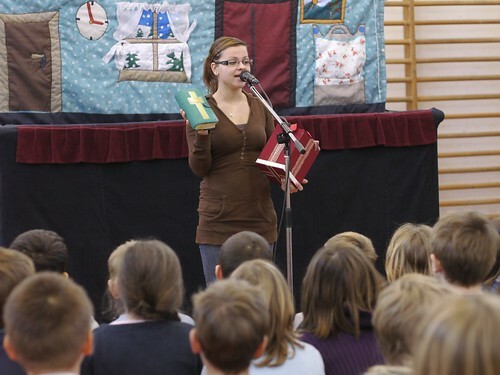 Above: Eszti continues to do an excellent job in each school telling the kids about Jesus Christ who died for our sins and offers the free gift of salvation to all those who believe in Him. 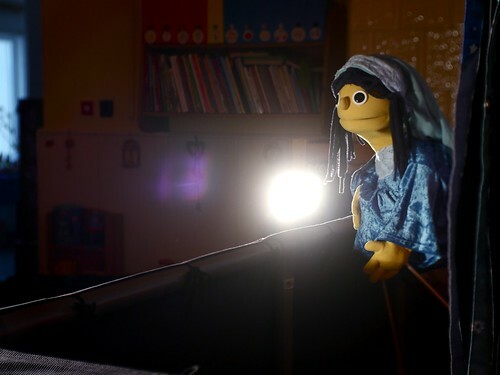 She quotes John 3:16 in each school, which is also quoted in the puppet show and highlights how the Bible tells the true story of the life of Jesus Christ. 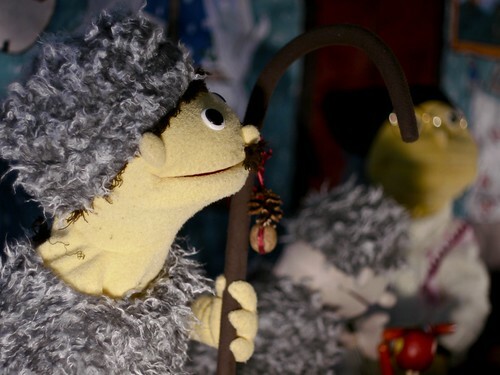 Above: As we near the end of our Christmas Puppet Ministry with one show remaining tomorrow, we’re close to having distributed 2000 CD’s and magazines to kids. Above: After the show MIki had a good conversation with Bori whom we have known for years through this ministry. 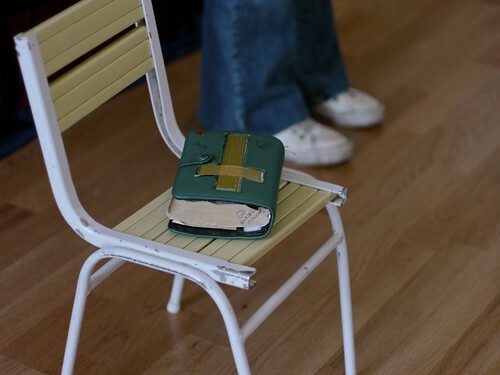 Bori has often turned to Miki’s emails about the Gospel and is really seeking. Please pray for her and for this connection to bear fruit. 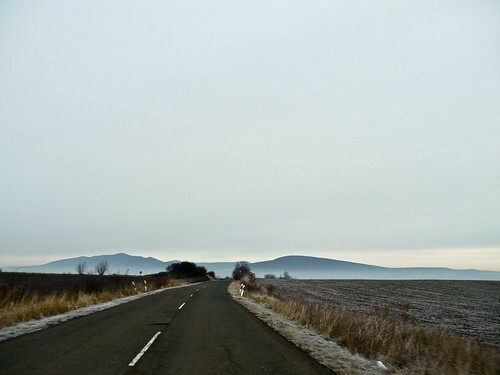 Above: A beautiful view as we travel from Héhalom to the town of Szurdokpüspöki. 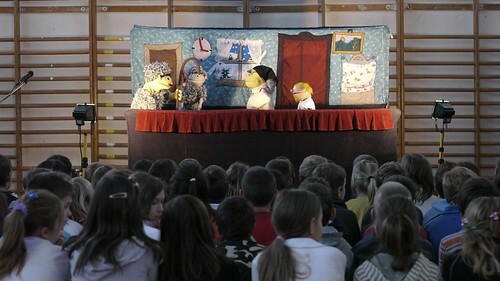 Above: For many of these schools, our Puppet Show is worked into the kid’s last day of school which is full of special programs. 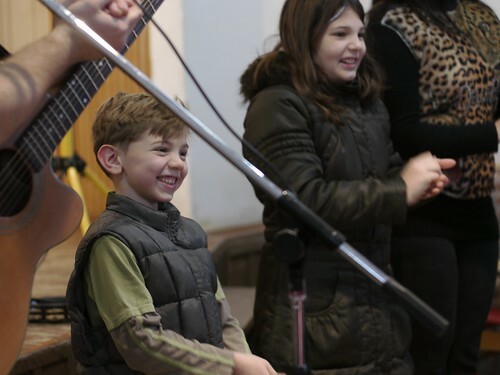 We’re so thankful to have the opportunity to give this Good News to these kids just before their winter break. 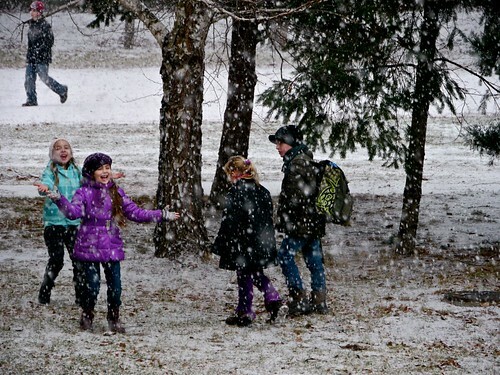 Above: After finishing today, the snow began falling and the kids began celebrating. Just maybe we will have a white Christmas. Tomorrow we will perform our last show in the town of Vanyarc. We didn’t initially have Vanyarc on our schedule, but we were invited to their community Christmas show by the Principal of one of the schools we already performed in this year. 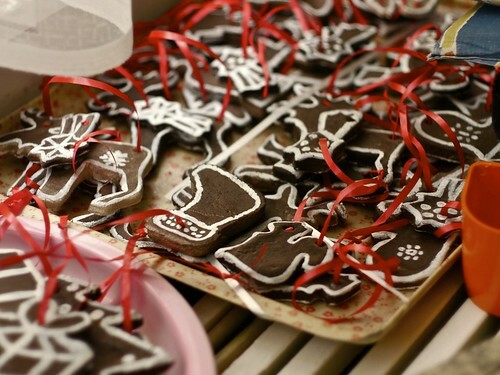 This show will include a mini Christmas concert and parents are invited with their children. Please pray for safe travel as the roads are a bit dangerous at the moment and for God to use us to bring glory to Jesus Christ. Please continue to pray for us to be healed of sickness and gain a great nights sleep tonight! 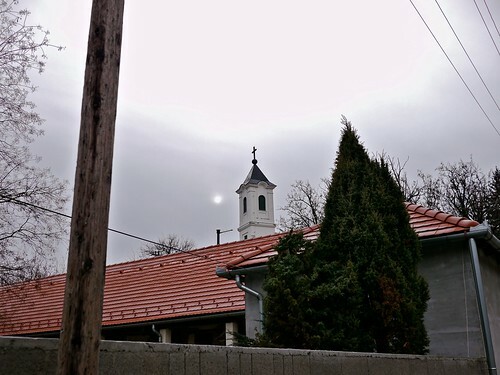 Above: The sun barely breaking through the overcast as we enter the town of Nagykökényes. Above: This one of the smaller preschools we visit each year with around 15 kids. 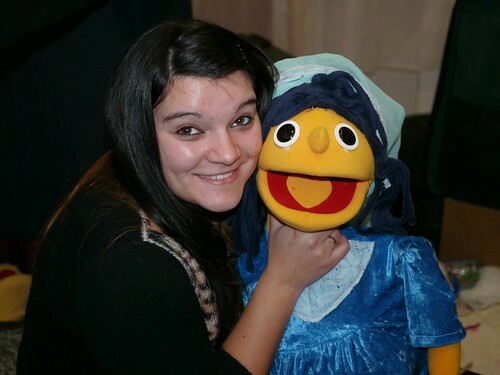 Above: For their first time serving in puppet ministry, both Eszti and Eniko have done an excellent job on our team. We’re very thankful for their hard work in preparing and the sacrifices they have made to participate in this outreach with us. 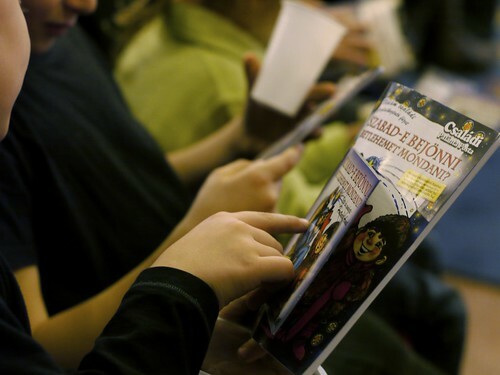 Above: Kids receiving the CD and magazine gift packets after the show. The teachers were impressed with the materials and even began doing some of the magazine activities with the kids as we were packing up and leaving for our next show. 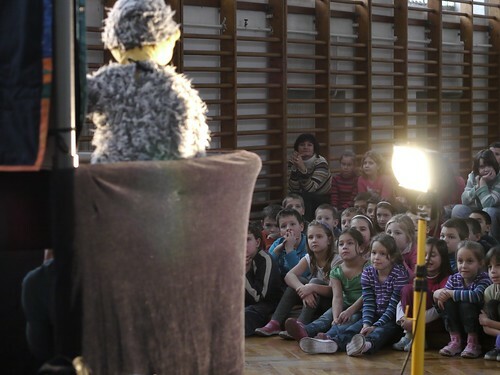 Our second show was in the town of Pásztó, in a school for special needs kids. 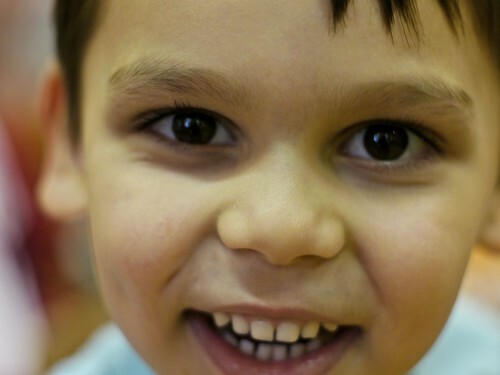 Some of these kids are here with mental disabilities, others with behavioral problems and still others as orphans. 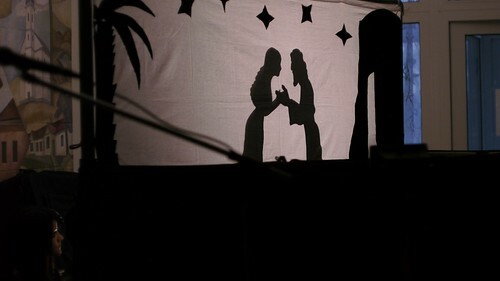 We praise God for his continued help in this third and final week of our Christmas Puppet Outreach. 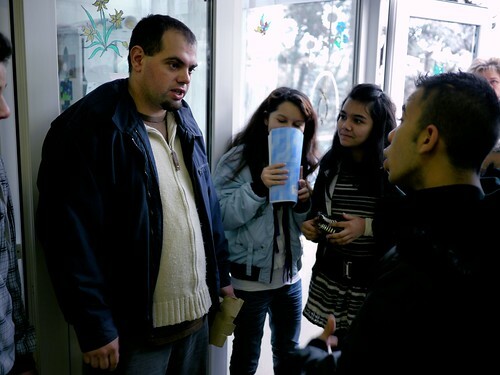 Although members of our team have been struggling with sickness, He has given us the needed strength each day to serve. The weather continues to be surprisingly mild for this time of year which helps us when we travel. 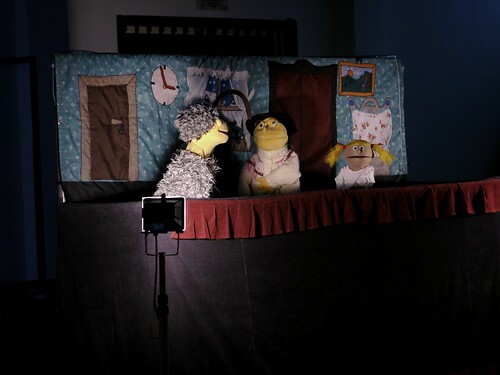 All technical equipment has been working great and in every location Eszti has been able to share the Gospel after the puppet show. Praise God for these open doors and for His grace in inviting this new generation to know Him through Christ. Tomorrow, (Wednesday) we have two shows in the morning. We appreciate your continued prayer support. Ziva continues to chub up (in a good way) and is bringing lots of laughter to the kids as they watch her funny expressions. It has been a big transition for everyone, but by God’s grace not a difficult one. The kids do a great job at helping more around the house and with the baby when needed and Sharon is recovering well. An entire nights sleep is something we don’t expect for some time, but God has been gracious to help Ziva gain good chunks of sleep through the night. What a special gift to have Ziva with us this Christmas. 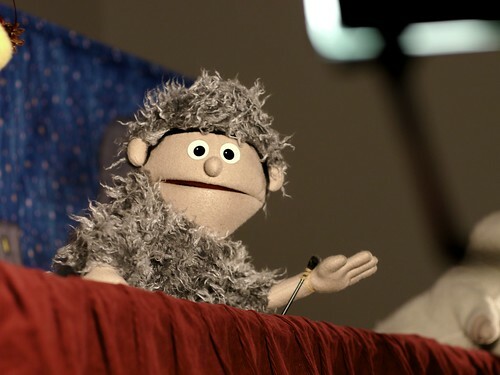 Because of our need to register Ziva with the immigration offices, I (Allen) had to miss Thursday’s two puppet shows in Hatvan. We praise God for how smoothly the process went to register her and for having all the right paperwork to complete the process. This had to be a record for requesting a residency permit. It was done in about an hour! In the past it involved a convoluted process of filling out papers, buying official stamps, getting multiple copies of our forms and identity cards...you get the idea. We praise God for his help in completing this process of registration. 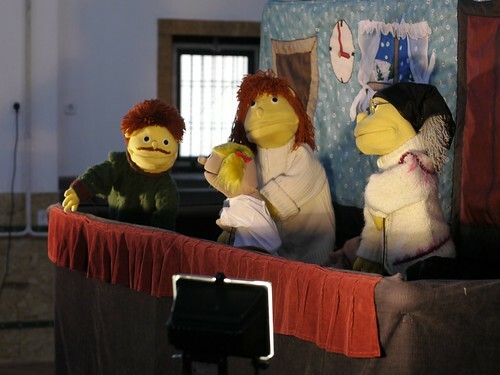 The team reported that the puppet show went well on Thursday. The kids from the preschool and adults (mentally disabled) from the care center are very familiar with out team and know some of us by name. The adults from the care center were so excited to see Miki and enjoyed singing along with this year’s song. Above: A wall of shoes. 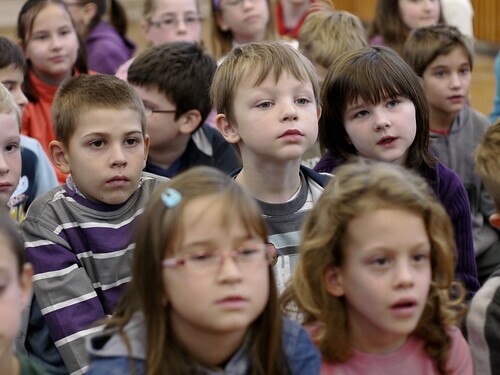 In Hungary, they distinguish between outside and inside shoes and after arriving to school, the kids immediately change their shoes. 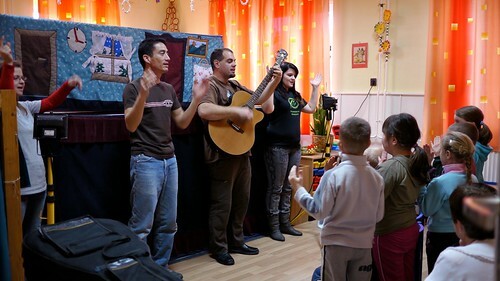 Above: There are lots of familiar faces in Zagyvaszántó as many of these kids have attended previous VBS camps in the summer or attended Bible classes in Petofibanya with Miki in the past. 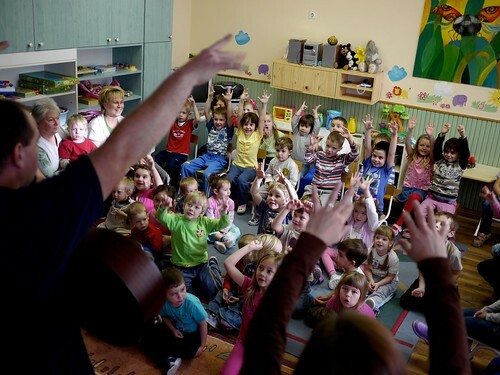 Zagyvaszántó is just a few minutes down the road from Petofibanya and many parents send their kids to this school. 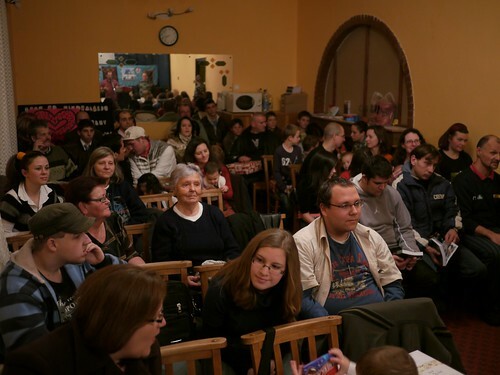 Seated far right is Réka, the daughter of Klári who previously was a regular attender to our English Bible Study. Since them Klári and Sharon have become good friends. 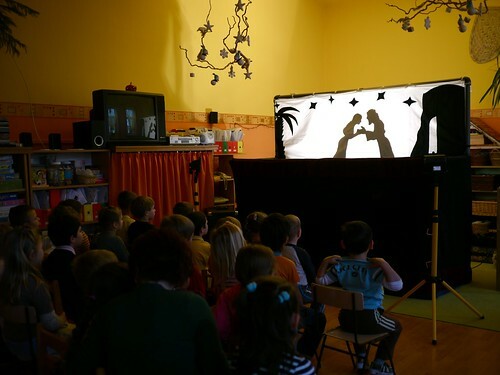 In the past in Zagyvaszántó, we had to organize a Saturday puppet show in the community center since the public school did not want us to perform. 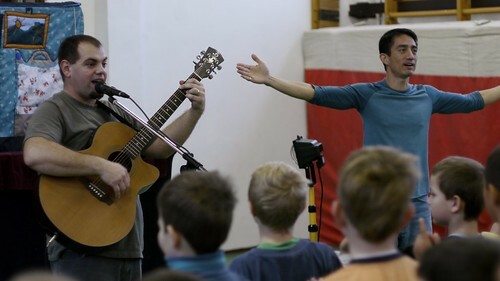 Praise God that in these past few years we have been allowed to perform in this school and for the familiar faces that we know are hearing the gospel through this ministry, through Bible classes and through our VBS every summer. The team is in good spirits but physically worn down. Roger, Miki and Allen are still fighting sickness and we’re thankful for a day of rest on Saturday. Please pray for our team to recuperate, gaining healing and needed rest so that we are refreshed for our next show on Monday. Please also pray for Elianna and Kira who are also fighting sickness. 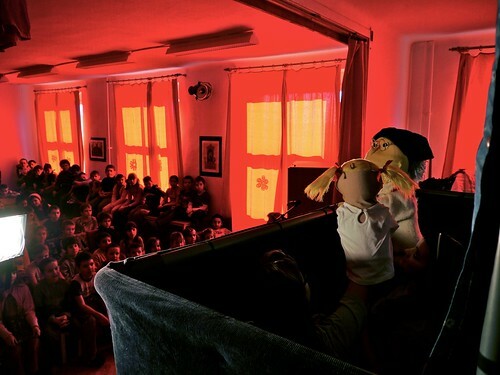 Above: Our first show was held in the small town of Heréd. 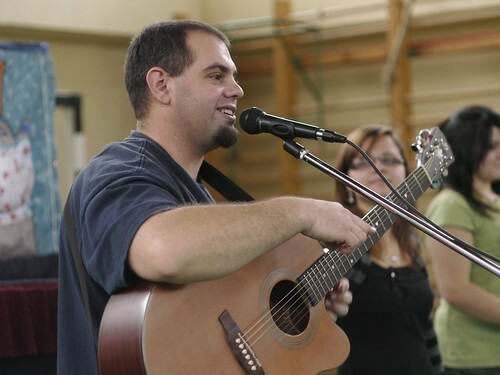 God has opened up more opportunities in this town to share the Gopel as we have held concerts, participated in community events and held Bible studies here over the past few years. 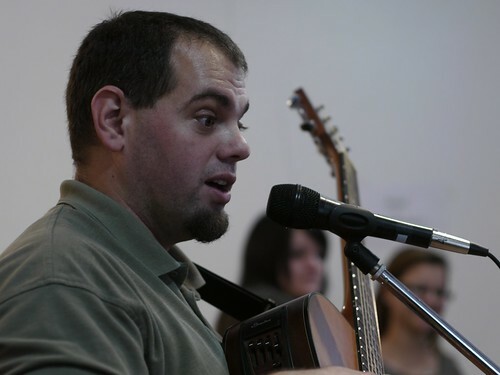 Heréd continues to be on our “radar” in our plans for church planting in the future. 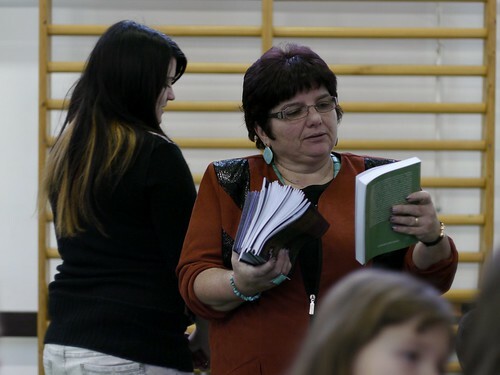 Above: The school principal that warmly welcomes us each year looking at a book we give as a gift to all the teachers. 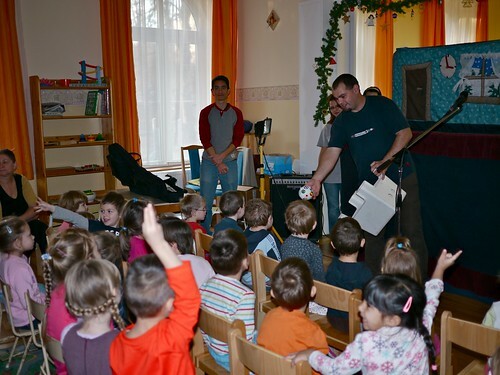 After finishing our show at Lorinci’s preschool, we carried our equipment to the elementary school located next door. Initially this school canceled our show scheduled for last week. Our teammate Eszti didn’t have peace about it and felt led by God after some time in the Word to call the school to try to reschedule. We praise God that her perseverance paid off and the school made time for us today. This is the only school that restricts us from distributing our gifts afterwards because of a past complaint of a parent that protested our being allowed to perform in the school. We’re thankful for another great day and for God’s Gospel being proclaimed through this ministry. Thank you for your continued prayers for us. Tomorrow, I (Allen) will not be able to be with the team as Sharon and I take Ziva to file for her residency permit (which needs to happen within 30 days of her birth). We appreciate your prayers for the paperwork and process to go smoothly at the office which is over an hour away from us. We also appreciate your prayers for the team to get needed rest tonight, for healing of Miki and Roger who are fighting a cold, for Allen’s back and strength for the two shows tomorrow. 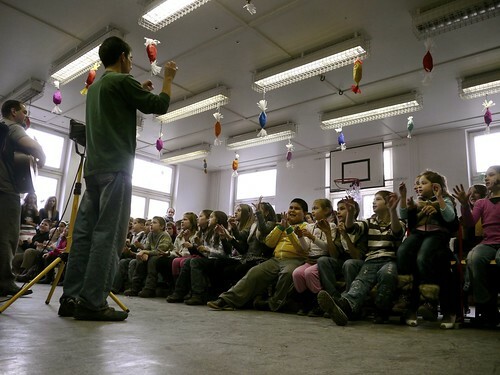 Above: Kids packed into the foyer of Szirák’s school playing some ice-breaker games with Miki. Above: After the show, Miki was able to talk to this young man about making a decision to believe in Jesus. Apparently two of the girls (in the background) indicated that they were believers, but he was not ready. 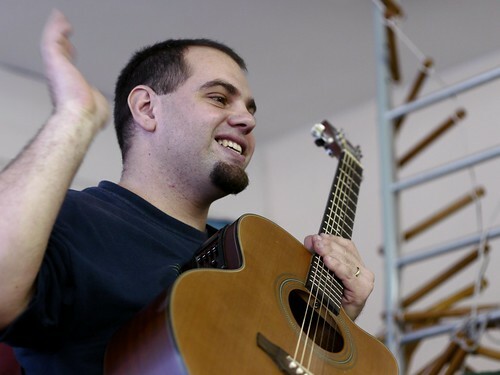 When Miki inquired why, he said that he knew that his life would have to change. 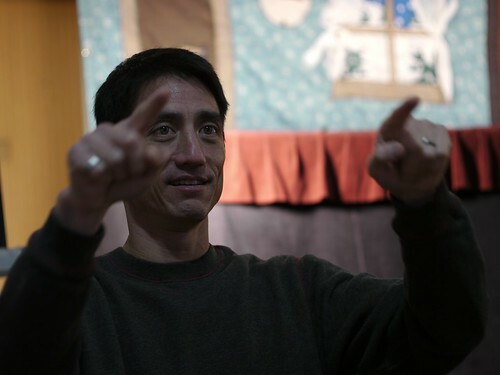 Miki encouraged him to consider the importance of the decision and also God’s gracious power to make us new. When we arrived, the principal whom we have known for years invited us to perform in his hometown of Vanyarc next Thursday. 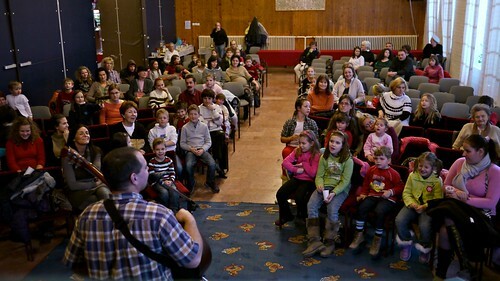 We have also been invited to perform a mini Christmas concert after this show in Vanyarc’s community center. We’re thankful for this opportunity and for the good relationship God has allowed us to develop with teachers and principals that have led to new opportunities. Above: Arriving to our second destination, the town of Bér where we would be performing in the local preschool. 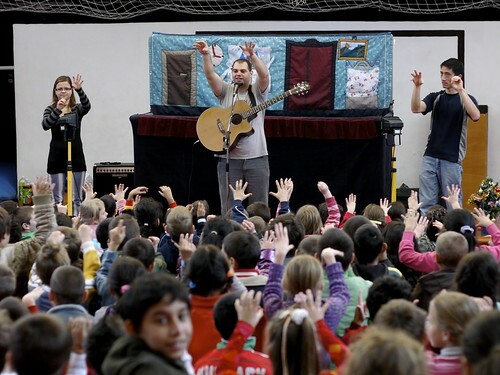 Above: This teacher was thankful for our show and took part in singing and doing the motions to the song. 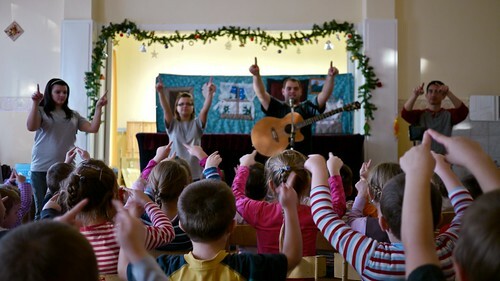 In some schools the teachers sit with grumpy faces completely disconnected and in others, like Bér they enjoy the message and the songs. 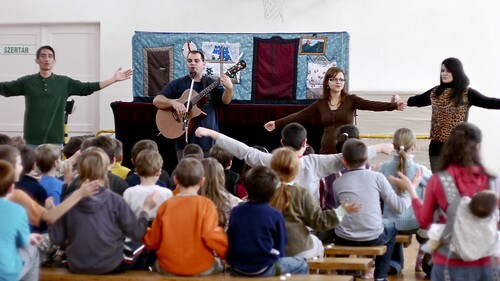 It turns out that this teacher actually lives in the town of Vanyarc where the principal from the other school just invited us this morning to perform. We told her the news and we hope to see her there as well. 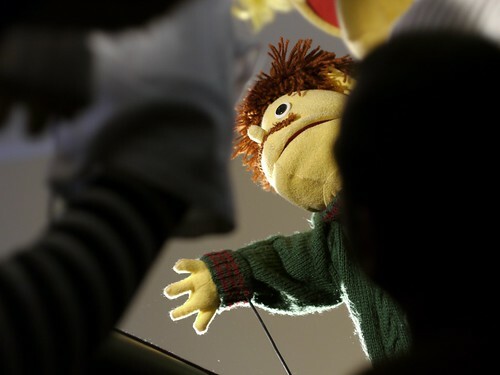 We praise God for another day free of major issues as we present the ;Gospel through this puppet ministry. The weather continues to be mild which is helpful. 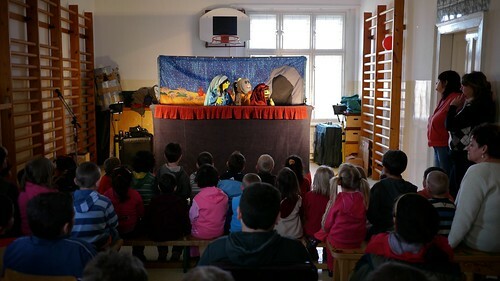 In Szirák, we had a young boy who was distracting the rest of the group at the beginning of the show, but after a bit of loving discipline he was able to calm down and was completely engaged throughout the puppet show and the presentation of the gospel. Thank you all for your continued prayer for this ministry and for these kids! Allen’s lower back was injured on Sunday causing pain when bending over. Please pray for healing. Miki and Roger are both experiencing signs of sickness. Please pray for healing. As we move past the mid point of our ministry we are feeling a bit fatigued. Please pray for a good nights rest and for the stamina needed for the remaining shows. 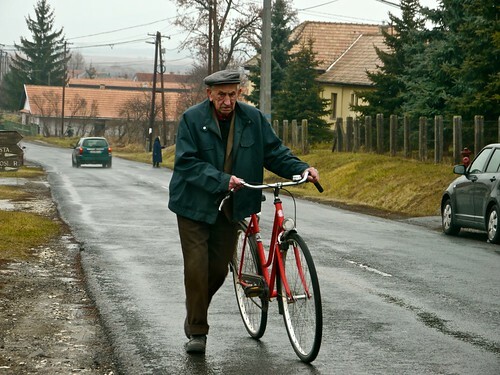 Above: An elderly man making his way through the town of Szarvasgede early in the morning. We would much rather have the cold rain showers we experienced today than icy and snowy roads which we usually experience this time of year. We praise God for the weather conditions and safety He has provided as we travel from school to school. 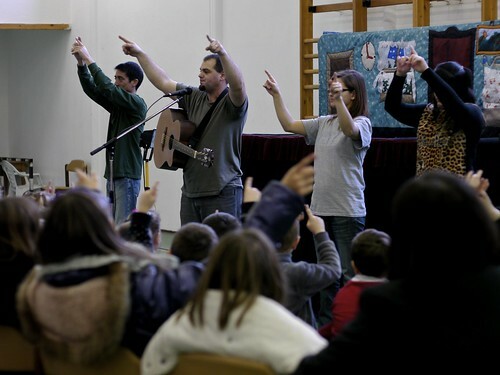 Above: Miki, Roger, Eniko and Eszti helping the kids learn the motions for our Christmas song. 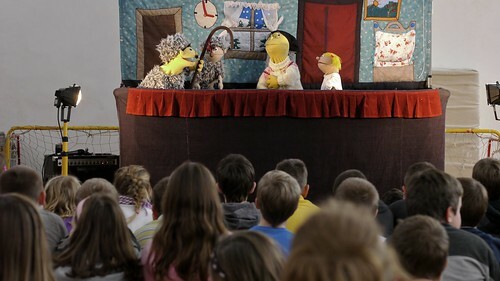 Above: Some kids from the front row kept asking me, “Do you remember me?” They commented how they remembered us from our Easter visit and they also remembered the puppet show we performed. They were very excited about today’s presentation. 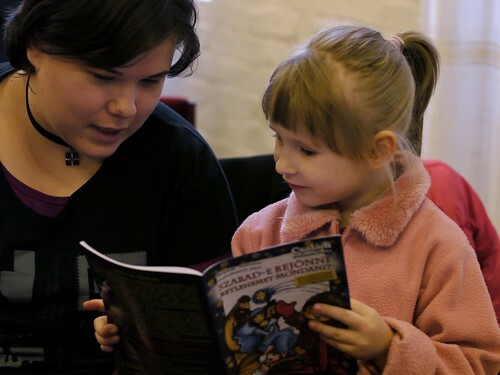 Above: Kids getting right into the magazines soon after we distributed them after the show. 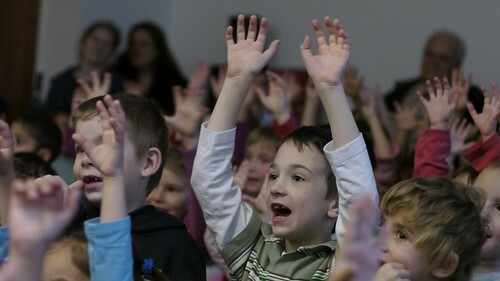 After Eszti explained the Gospel to the kids and said, “This gift is available to all those who believe in Jesus”, the kids began raising their hands and shouting out “I want it, I want it.” May these seeds produce fruit in their lives and lead them to truly follow after Jesus Christ by faith. Above: Eszti demonstrating her olympic skills on the balancing beam found in Jobbágyi’s gym. 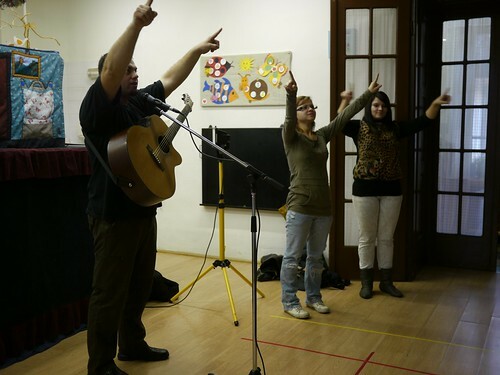 We praise God for His grace in forming this team and opening a door in Hungary for us to proclaim the Gospel in public schools. We are thankful to see kids paying attention and for all the equipment working well through each show. 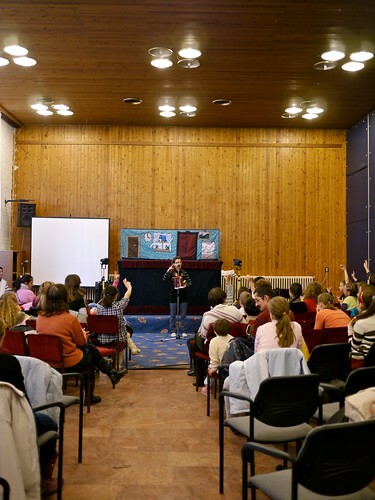 Above: A good turnout of parents and children for our show on Saturday in Gyöngyös’ community center. Above: It took a little work to get these kids involved in games and singing, but after a few minutes Miki was successful in getting them to participate and have a good time. 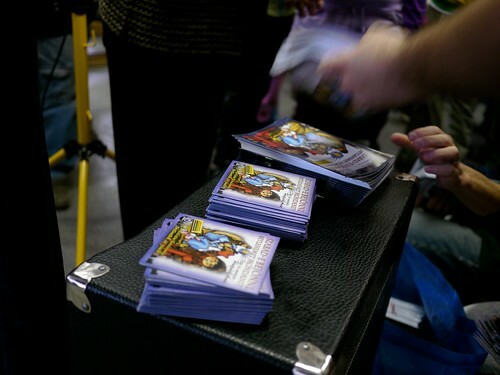 Above: After the show we were able to distribute this year’s CD and family magazine gift packets to each child. These materials offer more teaching about Jesus Christ and give the kids and parents opportunity to hear the message at home. 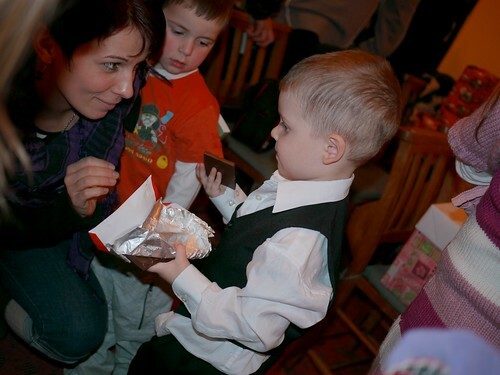 Above: More parents and kids taking a look at this year’s gift packets in Gyöngyös. 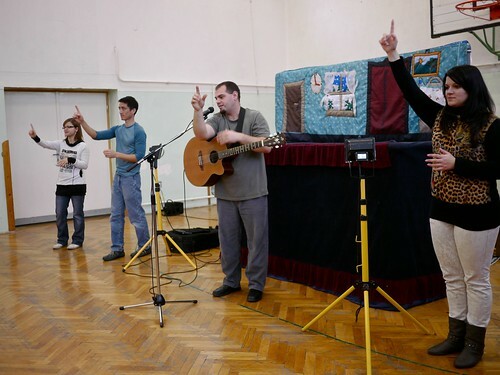 Gyöngyös, which is about half an hour away from Petofibanya was one of the options presented to us years ago when we were seeking God’s direction as to next steps in church planting. 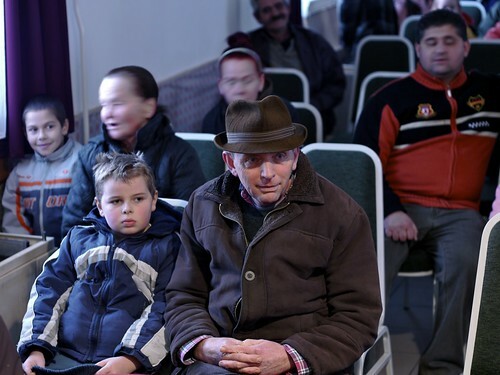 Unlike Petofibanya’s mere 3,600 population, Gyöngyös is truly a city with over 33,000 people. 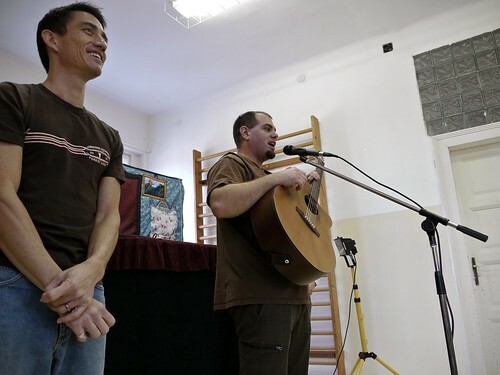 We are thankful that Jona, whom we have known for years, continues to serve as a church planter in Gyöngyös, a town in great need of the Gospel of Jesus Christ. Jona is in a network of various leaders and church planters that we hope to continue partnerships with for many years to come. Above: Before this morning’s show, we were invited to the teacher’s lounge and were able to have tea and a good conversation with the principal. After she shared about the growing needs of the school and the community Miki was able to share about our trust in God who provides. 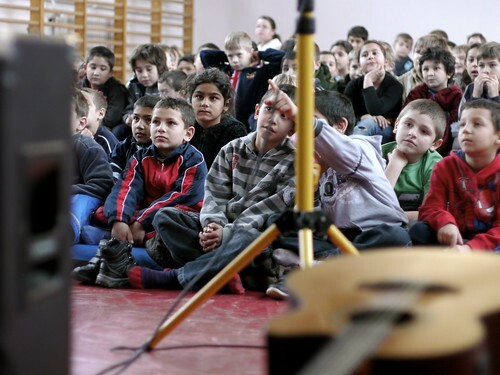 Above: The kids in this school who are mostly Roma were full of smiles as they learned the motions and words to this year’s song. Above: Jázmin, the daughter of a couple that has begun attending Miki’s Evangelistic Bible study over the past few months. 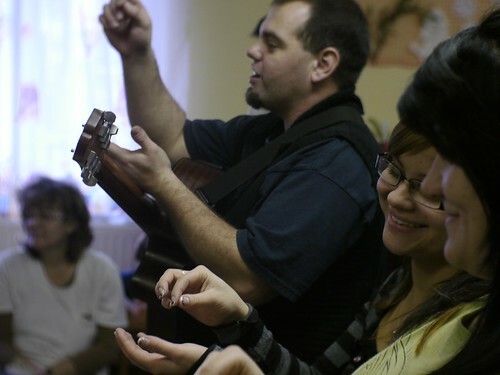 Miki shared that Jázmin’s mother, Monika put her faith in Christ just last Friday. 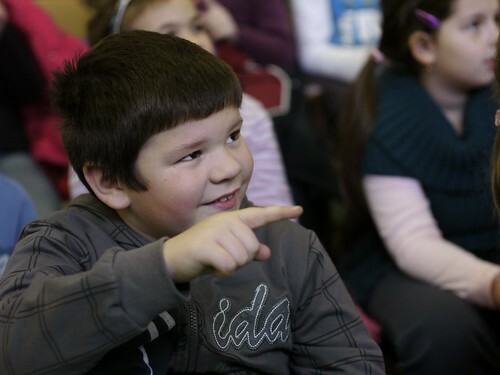 Lots of these kids in Petofibanya also attend Bible classes that teammate Eniko holds weekly. 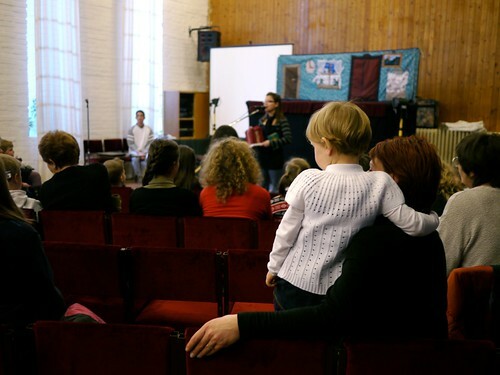 Praise God for His continued work in families in Petofibanya! 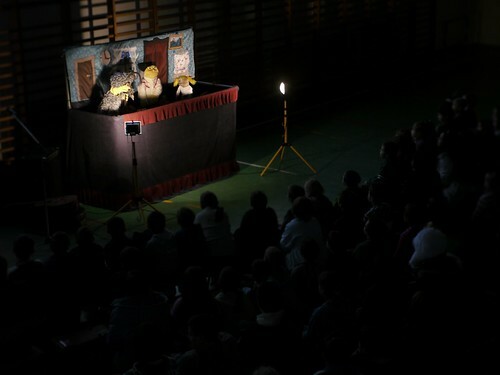 Above: Eniko and Eszti preparing their puppets just before the beginning of the show. Above: Some of the preschool teachers that we have known for years since all of kids have attended this preschool, and Kira is currently attending. Above: Sharon with Ziva tucked away talking with preschool teacher Anita. 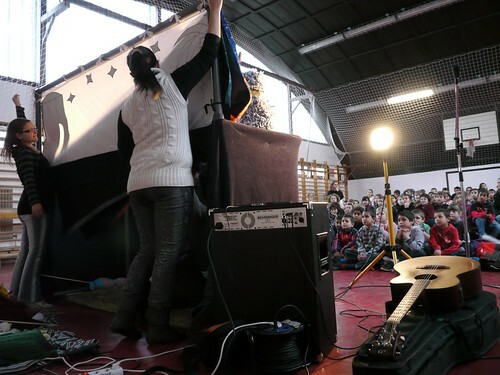 Above: Our third and final show for the day was held in Petofibanya’s elementary school’s gym. Many of these kids have attended our VBS over the years and currently attend a weekly Bible class with Eniko. 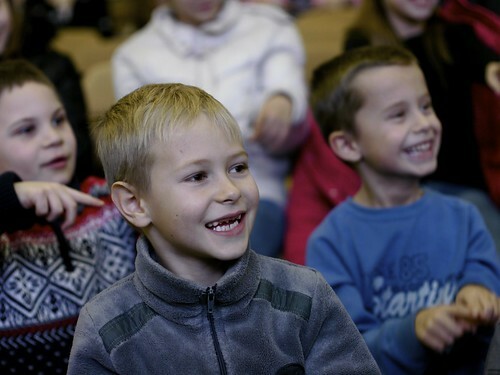 Over the years we have seen progress with the kids in Petofibanya, a school that is consistently the most misbehaved and the hardest place to perform in each year. This year I had to pull a few kids out of the front row in the midst of the show who were disrupting others, but afterwards the majority were able to pay attention and enjoyed the show. We hope to see many of these kids turn out to be like church member Gabi, now in his twenties, who we first met when he was this age. Gabi is now married (to Eniko), growing in his faith in Jesus and is attending theological training. Above: After todays shows, I ran into town to pick up the shipment of CDs and magazines that we distribute each year which just arrived (a little late). Thank all of you that donated money toward these gift packets that we give to each child. If you would like to contribute (we still could use donations) please contact us. After returning home, I was able to meet with my neighbor who I have been meeting with each Friday for over a month for an Evangelistic Bible study. 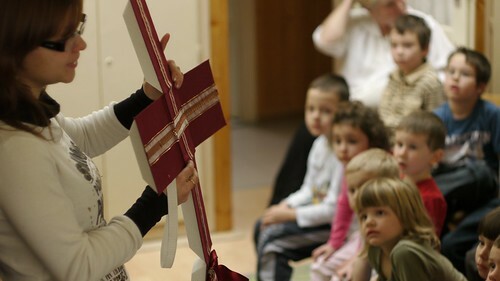 I believe Ilona (retired director of Petofibanya’s preschool) is very close to making a decision to repent and to put her faith in Jesus Christ. Weeks ago we started in Genesis chapter 1 and have been surveying the Bible. Tonight as we talked about the faith of Abraham, we skipped ahead to the New Testament and I gave her an overview of the Gospel message. It has been clear to me that the Spirit has been giving her understanding and she was able to repeat clearly what the Gospel was after we discussed it tonight. I challenged her to consider how she would respond to God’s declaration to believe in His Son Jesus Christ to be saved. What would she do with this gift of His grace? Ilona is counting the cost and I hope that this week will be considering all that God has been revealing to her through His Word through these past few weeks. 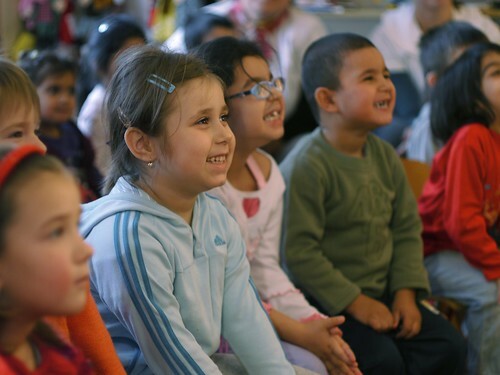 We praise God for the strength he gave to us for each of these performances today and for the kids being able to pay attention especially when Eszti shared the Gospel. We praise Him for our continued health, for protection from accidents, for the snow and ice-free weather conditions that allow for safer travel. We’re very thankful for the opportunity He has given us and hopeful that these are seeds that He is planting that will bear fruit in a new generation of Hungarians. 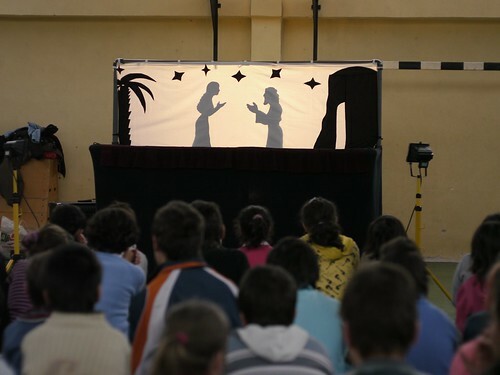 Tomorrow (Saturday), we have just one show in the town of Gyöngyös. 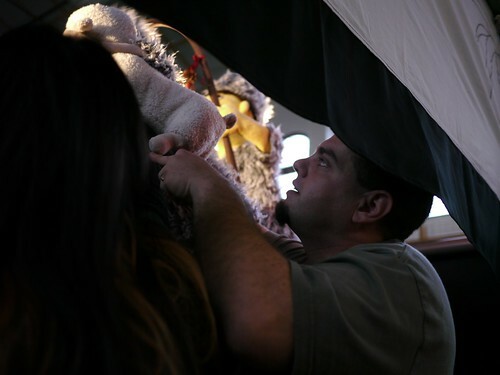 Please pray for me (Allen) as I will be filling in for puppeteer Eniko tomorrow. 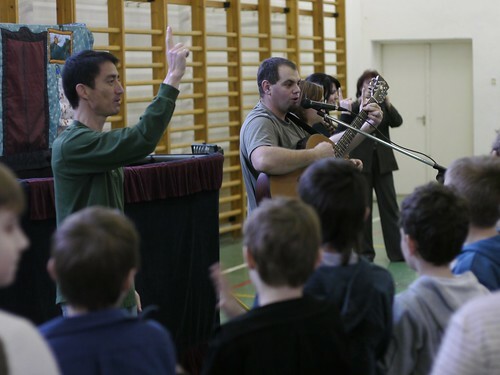 Pray also for Eniko who will be attending an extension course for Biblical training in teaching children in Budapest tomorrow. Please pray for the team to get needed rest tonight (some having trouble sleeping because of bad dreams, or children waking in the night). 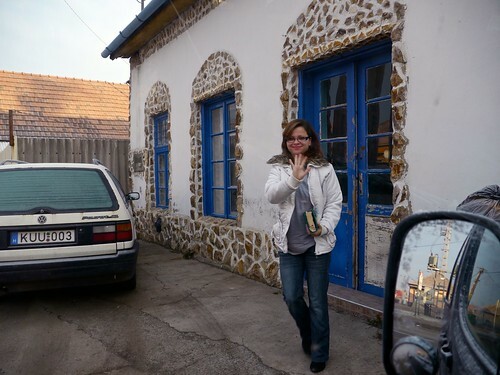 Please pray for Ilona to consider what God has revealed through His Word to her and for her to see how worthy Jesus Christ is as her Lord and Savior. Thank you for joining us in this ministry through prayer support! 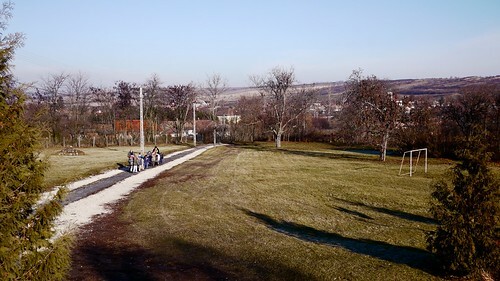 Above: Two of teammate Eszti’s kids Dariusz and Alina racing to their preschool in Selyp where we would be performing this morning. 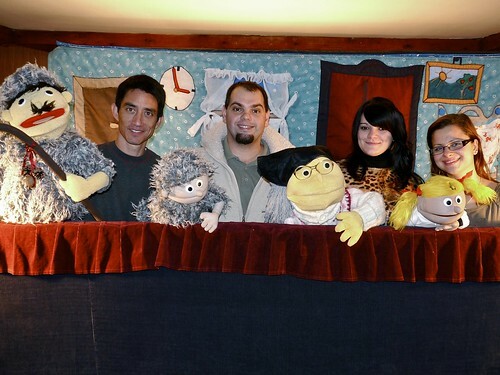 Today was also Alina’s birthday and it was a special gift to have the puppet show first thing in the morning. 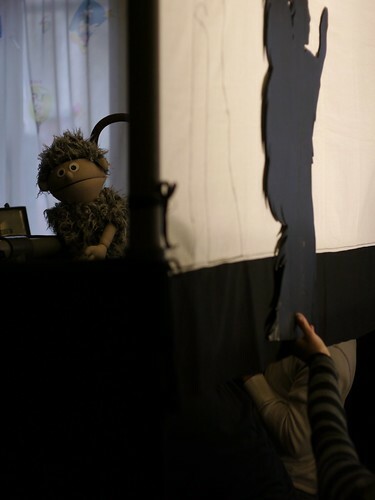 Above: Roger, Miki and Eszti about to turn that pile of tubes into our puppet stage. 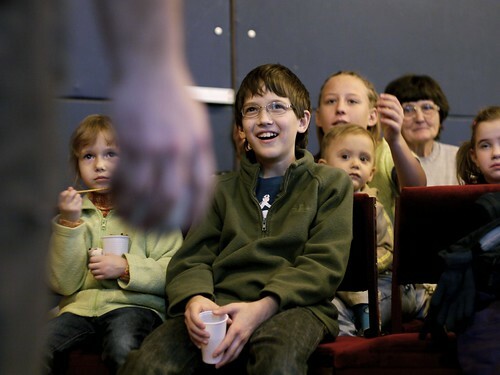 Above: With all the commotion of set up and strangers in their midst, some of the little kids are a bit anxious before the show. Miki does a good job playing games with the kids and the whole room is laughing in no time. 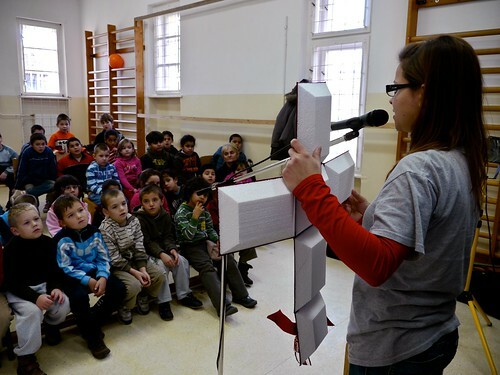 Above: Eszti’s well worn Bible is brought out at the end of each puppet show as she shares John 3:16 with the kids and summarizes the gospel. 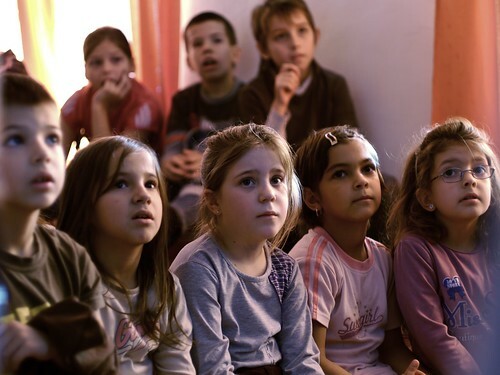 We are so thankful that we are permitted to tell these children about Jesus and proclaim God’s truth from His word. 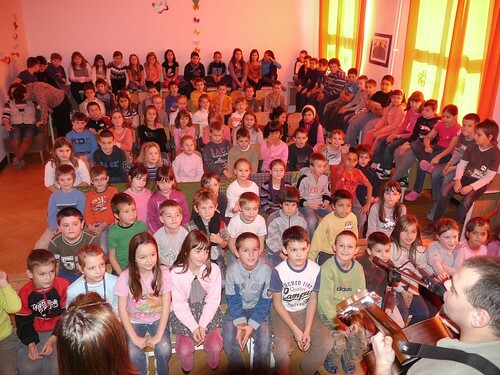 Above: As you can see there were a fair amount of kids attending our show in Selyp’s elementary school. 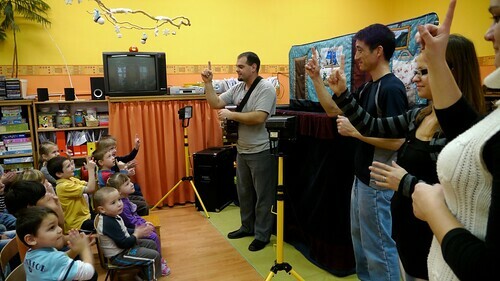 The increase in number sometimes leads to distraction, but these kids were well behaved overall and were engaged by the show and the message given at the end by Eszti. We praise God for a problem free day and for giving us this privilege to take the good news of Jesus Christ to these schools. 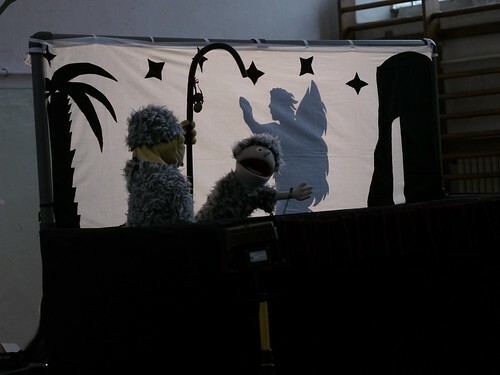 All technical aspects of the puppet show are working well and the team is a joy to serve with. 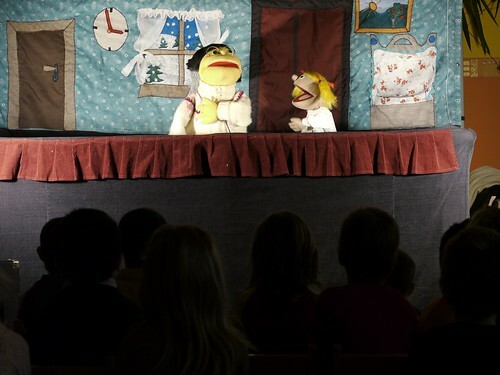 Tomorrow is one of our longer days as we have three puppet shows and much traveling. 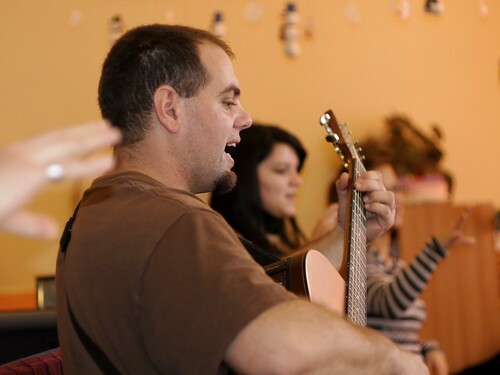 We appreciate your prayers for rest, and continued protection and success in this ministry of sowing seeds to a new generation of Hungarians. 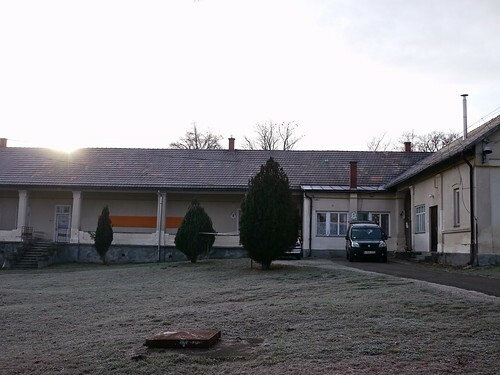 Above: Morning frost in front of the preschool in Kisbágyon. 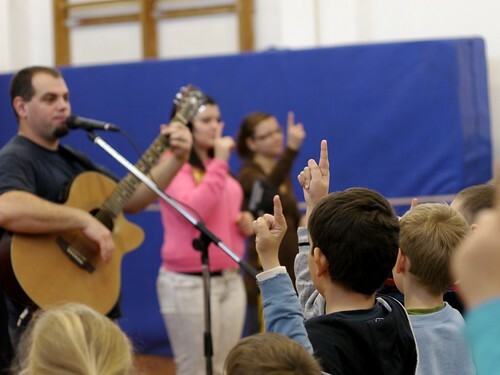 Above L to R: Eszti, Roger, Miki and EnikÅ‘ teaching this year’s song about Jesus Christ, Savior and Son of God. Unfortunately, we had an issue with sound again this morning and ended up having to play the mp3 through tiny speakers into a microphone (if that makes any sense). Praise God that this was not a larger room with and the solution served it’s purpose well. Praise God that we had time to return home and find the cable adapter we needed to solve all of our sound woes by today’s second show. 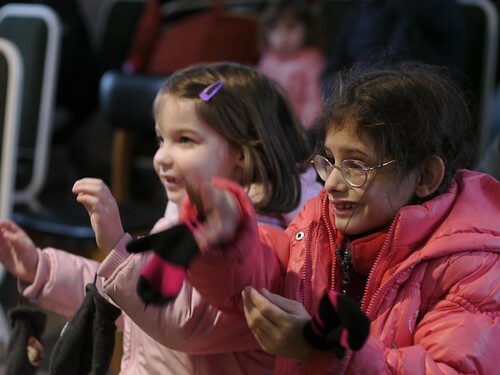 Above: This was one of our younger audiences and they really enjoyed the Christmas story. They were gracious toward us and even offered handmade crafts as gifts to us as we packed up to leave. 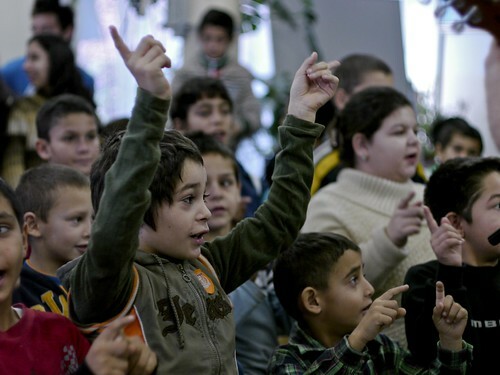 Above: Kids from Egyházasdengeleg making the trip from their village preschool to the local middle school for today’s show. 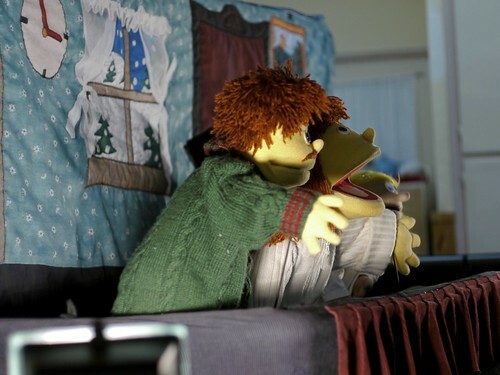 As a result of visiting with our puppet ministry, on multiple occasions we have been invited to this town’s holiday celebrations in the summer to participate by offering face painting and crafts. At our craft table we always try to find creative ways to share the Gospel with those who attend. 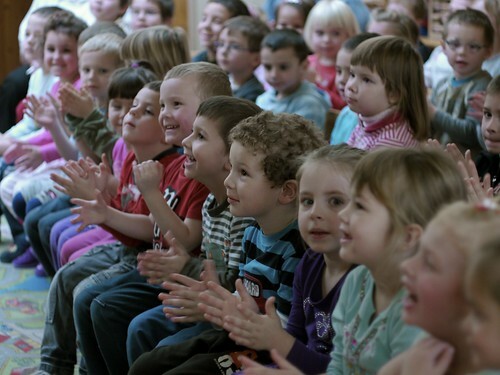 As we visit these schools twice a year I recognize kids from the past who end up moving toward the back rows to make room for the new faces in the front row. The kids from this town commented how they listen to last year’s CD and they were even familiar with the song we brought for them this year. 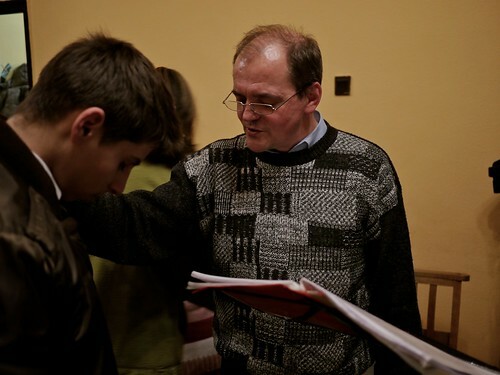 Above: Eszti sharing the gospel after the show. Above: One of the benefits of coming back to these schools twice a year is getting to know the teachers. Today, we sat and talked for half an hour after the show. The teacher (far right) shared how things seem to be getting continually worse in their community. She has noticed a growth in selfishness, a lack of discipline and home lives that are destroying children’s well being. I was able to share the hope we have in Jesus and the power He has to transform lives. I gave her the example of two men in our church who were alcoholics that God saved by His grace and how God restored their families. Jesus is the answer, not a theory or a fairy tale but the One behind such miraculous transformations. We are thankful for these open doors to share the hope we have in Christ with these children and with the teachers. We praise God for his protection and guidance today. Thank you for your continued prayers! After dropping Ben and Elianna at the bus stop, then taking Kira to preschool, I returned home waiting for the team to arrive for prayer. 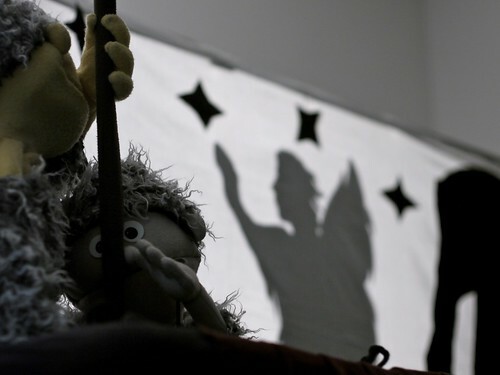 The first day of puppet ministry is always exciting and I’m sure even more so for Eniko and Eszti who are part of the team for the first time. Above: On our way to our first destination in the town of Kálló. 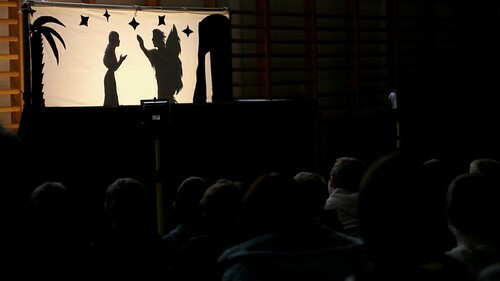 Above: Eniko with the Mary puppet (I can hardly tell them apart). Above: Our puppet show is prerecorded and played on this Mp3 player. After plugging it in and testing it out, we only heard faint distorted sound. There was something wrong with the input jack! 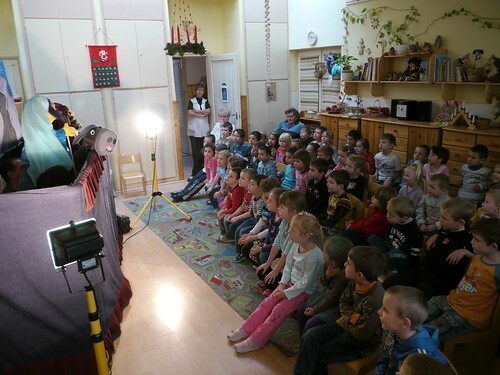 This was a big problem as the kids were just minutes from filling the room to see the show. 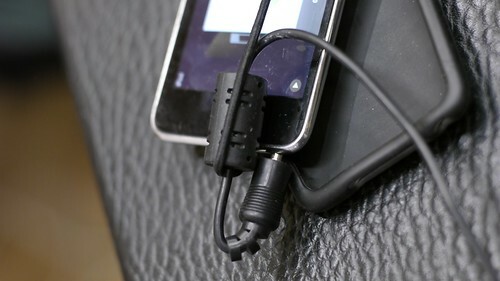 We praise God that we were able to fidget with the cable half way out and an elastic band holding it place to make it usable. 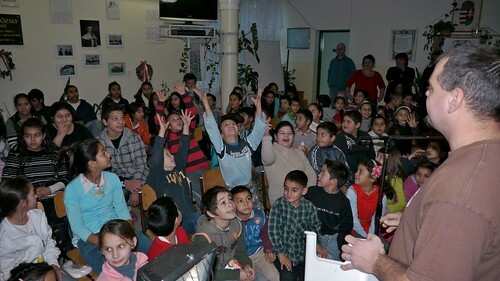 Above: Miki having some fun with the kids before the show in Kálló. Above: One of the pastors that visits the home of a grandmother and visiting granddaughter to share the story of the birth of Jesus Christ. 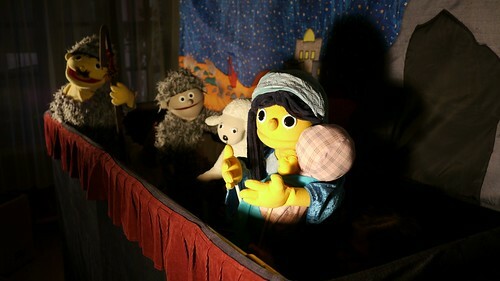 Above: I love the kids expressions as they were drawn into the true Christmas story told by the puppets. Above: Mary with baby Jesus at our second destination, the town of Erdotarcsa. Above: A look behind the stage. 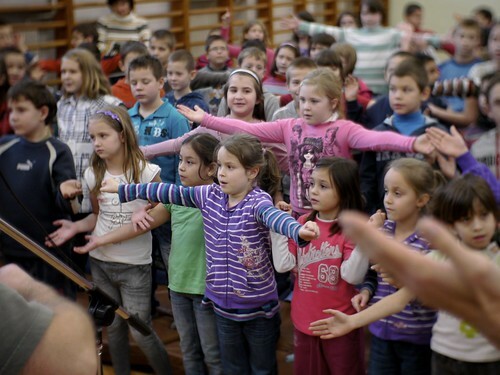 Above: Eszti and Eniko helping the kids learn the motions to this year’s song. 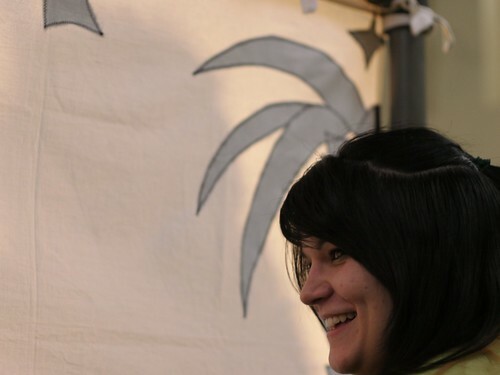 Above: We’re so thankful for Eszti taking on the responsibility of teaching after the show. 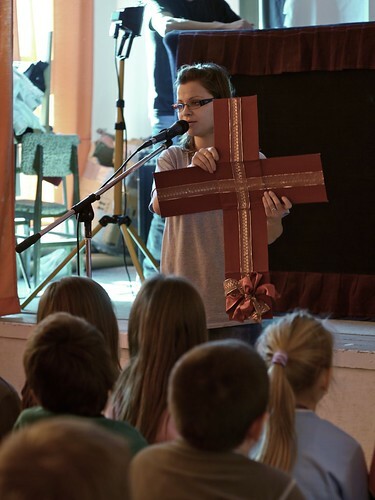 She did a great job explaining the gospel and used a gift box that unfolds into a cross to explain the greatest gift that God gave to us in Jesus Christ who died for our sins. Thank you for your prayers! Other than the sound glitch that God graciously solved, the day was free of issues that would distract from the message of the Gospel being proclaimed in these two schools! Tomorrow we have off and we begin again on Wednesday. We appreciate your continued prayer support. Above: Baby Ziva hanging out with mom as the kids set up and decorate the Christmas tree on Saturday. 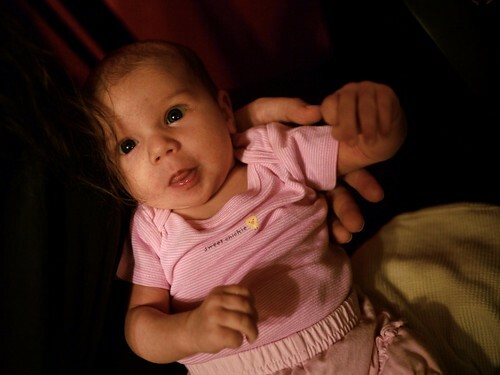 Ziva and Sharon are doing well and Ziva is better from her initial jaundice. Everything was fine at her two week check up and we’re just keeping an eye on her weight to see if she can regain her birth weight.